If your game doesn’t include a novelty spooky reskin during late October/early November, is it really a game at all? The wise folk at Epic Games clearly knew the answer to that question is a resounding know, a wisdom aptly reflected in Fortnite’s latest patch notes. Check out our Fortnite Battle Royale guide. 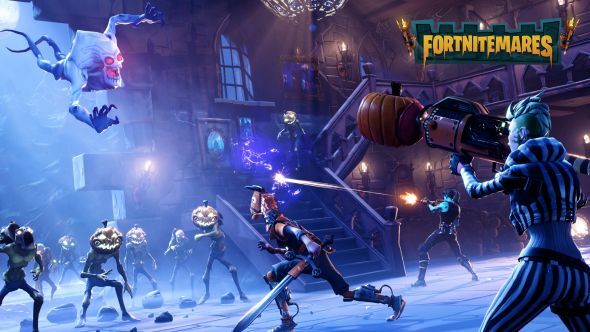 In the cleverly named ‘Fortnitemares’ update, Epic are introducing a lot of spooky new content. As far as I can tell from the pictures they’ve provided, that looks like a lot of pumpkins, but there’s also a strong Grim Reaper vibe going on. The update goes live starting today, October 26, and the two new character skins and one new weapon skin will be available until November 4. Elsewhere in the patch, there’s a significant focus on the runaway success that is Fortnite Battle Royale. As well as introducing leaderboards, which allow you to show off your total wins as well as how many times you’ve come close to those elusive wins. There’ll also be seasonal levels, earning you unique rewards depending on your eventual rank. The patch also introduces ‘Slurp Juice’ to Battle Royale. The new regeneration potion heals players and replenishes their shield by 25 points each over 25 seconds. There are also a bunch of balance changes being made to weapons. You can read the full patch notes here.